There are dark or black deposits of various type in the Rhynie chert: at the bottom of once water-filled pockets present during silicification, as level plates in such pockets or within Horneophyton tubers, on detached or adhering plant cuticles, or on cell walls of early land plants. In the case of Ventarura, cells with dark deposit on the walls have been interpreted as sclerenchyma, which is most probably erroneous . 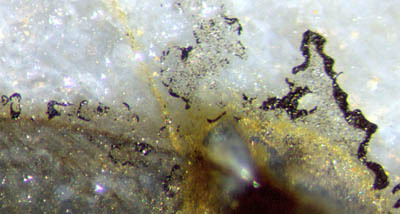 The black deposit shown here is of a different aspect. It looks as if once it had been an oily substance within a narrow gap of a crack, then had become solidified and glossy. 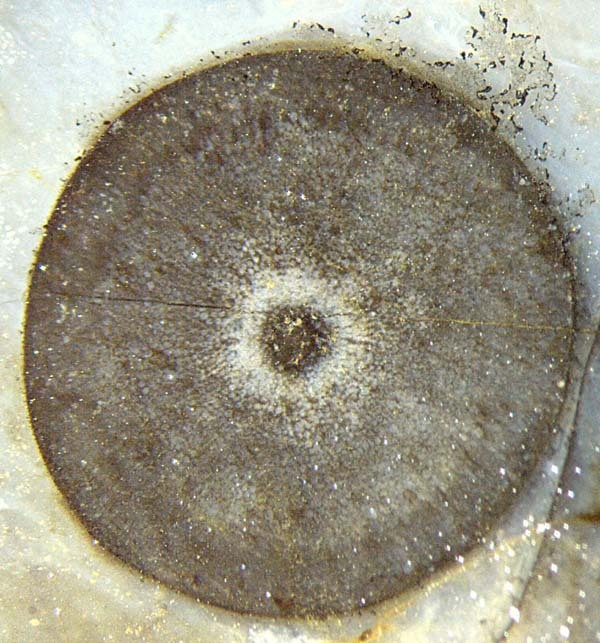 Figs.1-3: Aglaophyton cross-section, 4 mm, with dotted areas along the circumference, partially bounded by glossy black blobs of various shape; image successively enlarged. More glossy black matter of this type is shown in Figs.4,5. 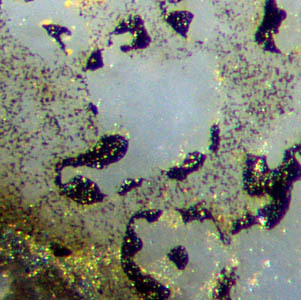 Figs.4,5: Black substance near the contour of Aglaophyton sections on an old chert fracture face. Width of either picture 1.4mm. Obviously the black substance in Figs.1-5 had been deposited after a horizontal crack had run along the chert layer. This could have happened at any time within 400 million years, quite recent times included. Unfortunately, the observations discussed here seem to provide only little information suitable for narrowing this huge time span. Fig.7. Flat blobs of black substance on a face inclined to the picture plane. Width of the picture 2mm. It takes some effort to imagine the 3D-situation related to Fig.7. Let the bluish area on the right be called the main fracture face of the sample. The brown area on the left is the cylindrical replica of an epidermis seen from within. Here the crack had left the main fracture face when it came upon the cuticle as an easy crack path. The string of black patches marks the intersection of the cylindrical face with the imaginary continuation of the main fracture face. The patches are inside the chert behind the brown cylindrical face but are out in the open on the bluish flat face. All of them are on the common flat face, (which is not perfectly plane across the sample). - thereby the black substance was laid bare at the surface, except for rare deviations as in Fig.7. Obviously the black substance or its precurser must have been in a (transient) mobile or fluid state. From the above observation (3) it may be concluded that the source of the possibly oily substance had been at the surface of the embedded plants, which poses another problem and suggests a solution. Usually the plants do not emit organic substances while or after being silicified. Something unusual must have been going on. One thinkable option is the following. It is known that the cuticle covering the epidermis is highly decay-resistent so that it can persist in the chert over geological timescales (and may make its presence felt as an easy crack path as in Fig.7). It consists of polymers and waxes which do not move about in the chert. Perhaps the solid cuticle or some of its components can be turned into mobile or fluid decay products by the action of microbes. In the present case, the microbes could have reached the embedded plant through the gap of the crack and broke down cuticle matter into fluid decay products seeping out into the gap. Apparently a transient liquid substance is seen in the above pictures, with scattered dots of irregular shape, which could be clusters of microbes. 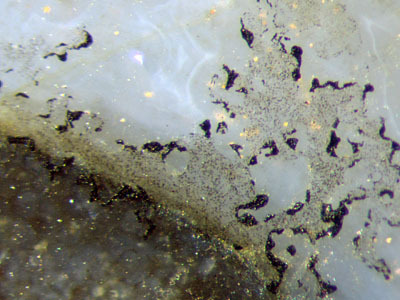 The comparatively big blobs seem to have formed by accumulating some amount of liquid of oil-like consistence, dots included, and by subsequent transformation into a glossy black solid substance. It must be admitted that this is not really an explanation since some questions concerning the process steps have remained open. If further investigations confirm the interpretation of these pictures as evidence for the mobilisation of cuticle substance, they could serve as illustrative material for the formation of mineral oil from plant matter. Photographs: Taken from the raw surface of a Rhynie chert fragment found by Sieglinde Weiss in 2014. H.-J. Weiss : Rhynie chert – Implications of new finds. European Palaeobotany and Palynology Conference 2014, Padua.